Climate and Agriculture in the Southeast | Are you prepared for a tropical storm? Are you prepared for a tropical storm? 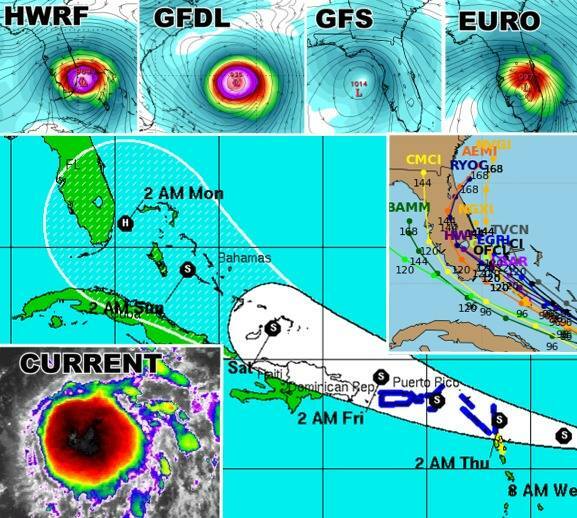 As meteorologists watch the evolution of Tropical Storm Erika today, it is becoming more clear that Florida is going to be impacted by the storm. What happens after that is less clear, but if you live in Florida, southern Georgia, or the eastern Carolinas you should be watching the outlooks closely. It now appears highly likely that Erika will be affecting southern Florida by late Sunday, and outer bands may bring rain and squalls in well ahead of that. Where it goes after that is still not well known. I grabbed this composite picture from http://www.spaghettimodels.com to show the range of possibilities that four different models are predicting. As you can see, the position of the storm early next week as well as the strength of the storm at that time vary quite a bit from one model to another, and also from one model run to another as new information comes in about the storm. If you are in the area that will potentially be affected by the storm and have outdoor activities planned for Sunday through Wednesday time frame, you should pay careful attention to updates as they happen. Changes to the final path of the storm are likely to continue as the storm continues to grow. If you are a home owner or business owner, you should prepare now for heavy rain, high or gusty winds, and flooding in low-lying areas. Posted in Climate and Ag in the news, Coastal, Tropical weather. Bookmark the permalink.